I could go on and on about this book. It is so very inspiring. Instead of writing until I am bleary eyed, I will focus on one aspect, one which is resonates closely to me. I have been calling it "Emergent Curriculum" for years, but the author of this book (the book is actually a series of articles) calls it by a different name. It encapsulates the idea of "Emergent Curriculum" much more succinctly. As an Early Years educator, it is a philosophy that guides my work. 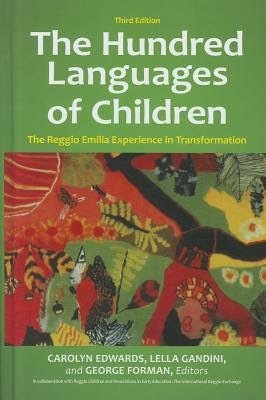 I highly recommend this book, not only for those of interested in Reggio, but for all teachers, at all levels. The curriculum is child-originated and teacher framed. The children, through their natural curiosity and enthusiasm, bring up issues and ideas from their personal realm of understanding, and the teacher reframes those ideas into more achievable and contextual academic goals. This is done through three components; design, discourse, and documentation. Design. Children and teachers are encouraged to design their thinking and ideas by making records or plans. This addition to the natural play asks the child to take their mental ideas and make them symbolic for an audience. This may look like a drawing, a clay figure, a photograph, or other media. The designer (child or adult) must be aware that their design is going to be read and interpreted by someone else, so readability must be considered. Discourse. This is more than talking, it reflects the constant struggle to understand others and their varying perspectives and shifts of viewpoints. Learning happens best when we approach an idea or belief with an open-mind and evaluate our assumptions and let them grow and expand. The teacher or the child may provide points of discourse. Documentation. This refers to an artefact that helps others understand the behavior or thought recorded. The most important aspect of documentation is that it includes an interpretation or description. These interpretations are evaluated and reevaluated by children, teachers, and parents, and act as a focal point of future discourse and learning engagements. An Example. The children ask a question. They discuss their theories (discourse) and create a drawing (design) that explains their theory to others. The drawing are the interpreted by the teacher and parents (documentation) and this leads to further questions (discourse) to help them grow their understanding of the idea. The children take the new questions and wonder (discourse) and then revisit their previous drawings and re-evaluate them (design). The teacher records the process (documentation) and reflects (discourse) on how the children have grown and changed.